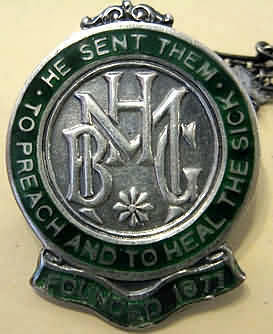 I was intrigued by this little badge, as the Mildmay Mission Hospital, was part of the London Hospital group during part of my training. When we started PTS in October 1981, about four nurses attached to our set were known as the 'Mildmay Nurses'; and they spent some of their training at this little hospital. Later on in 1986, I was based as a District Staff Nurse, in an office within the Mission Hospital. Mildmay Hospital has an interesting history. During a cholera epidemic of 1866, the Rev. William Pennefather (1816 -1873), vicar of a church in Mildmay Park, decided to help the East End sick. In a bid to improve the living conditions of the poor, he recruited a team of christian women, who became known as Deaconesses, and whose training as missionaries had included biblical tuition, sewing, cookery, housekeeping, singing and book keeping in preparation to work in a Mildmay Mission or abroad. (1) Pennefather's missionary projects included; a Men's Night School, Sewing classes for widows', a Flower Mission, Lads' Institute, a Servants' training home and a Missionary Training Home, he took some inspiration from a Lutheran 'Order of Deaconesses' in Germany. 1. D.Taylor-Thompson, 'Mildmay- The Birth and rebirth of a unique Hospital'. London, 1992. 2. D.Taylor-Thompson, 'Mildmay', pg 8. 4. The Royal London Hospital Archives, MM/N/1/2 , Mildmay Mission Hospital, volume 2. With many thanks to all those who provide encouragement and support, in particular to my husband Harry and Will for his seemingly boundless and energy time in getting these articles up on Schools of Nursing.